How Much Should You Save For Retirement? How Big Should Your Nest Egg Be? We all know that we need to invest for retirement. But, how much is enough? How much do we need to live comfortably? How much should we withdraw in order not to outlive our money? These are some huge questions, and a lot of the answers depend on what assumptions and inputs you make into the calculations. I wanted to share with you some quick calculations that you can make to see where you stand with the “average” person saving for retirement. While this is not a replacement for careful investment planning, but it is a great start. Divide each side by 4 and you get E = I x 20. Still with me? See that wasn’t so tough of a math problem. 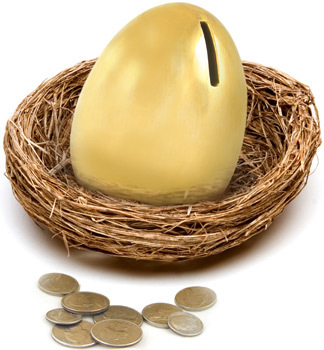 So, translated into words, the rule of thumb in this simple scenario is that your nest egg should have approximately 20 times your income at retirement in it in order to retire and withdraw 4% a year and not outlive your nest egg. So, for example, someone making $50,000 a year should have a goal of having $1 million saved for retirement in order to replace 80% of that income by withdrawing 4% a year. There are quite a few good financial calculators on the internet that can help you determine what may be right for you in retirment. Now, I am not a financial planner, and everyone’s situation is different. You should seek the help of a qualified professional. The tips and topics discussed here are not a substitute for great financial planning advice from a CFP. Saving for retirement may have some new barriers to hurdle. Remember, just before the conservative take over of congress in the early 1990s, the Clintons proposed taking a percentage from evryone’s retirement investments/savings. Fast forward to ultra left PRESBO, ultra left Nancy, and a left leaning filibuster proof senate. They have seen how the government got away with nationalizing retirement investments/savings in Argentina. If many big gov leftists are not replaced in 2010, I wouldn’t count on my investments and savings.